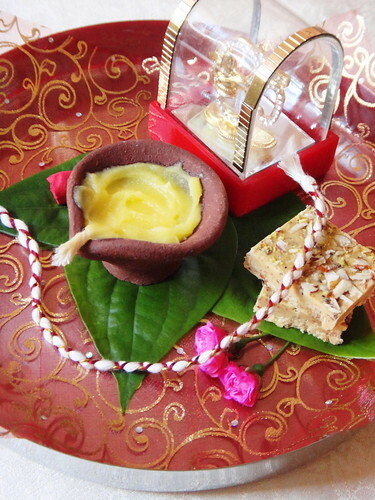 Happy Raksha Bandhan folks! 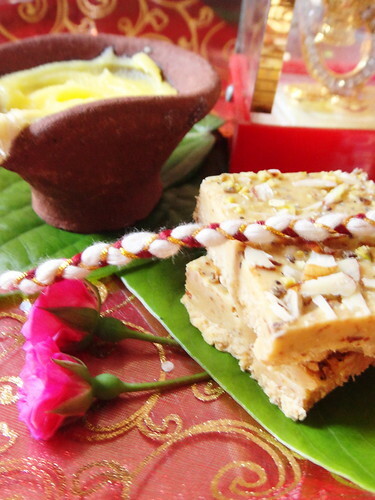 This year I made besan barfi – my very first attempt at making this barfi – which thankfully turned out quite well. As I’ve mentioned before, I’m not that gifted with Indian sweets but the step by step tutorial from What’s Cooking Mom made everything really easy. There is no sugar syrup that you have to bring to one-thread consistency nor do you have to go through the pain of shaping each sweet into a ball or a roll. I did not even worry about getting a uniform shade and texture; the small sugar lumps got caramelized in the residual heat of the mixture and I do not find anyone who objected to these crunchy bits of caramel in my besan barfi. In a non stick pan, melt ghee over medium heat. Add besan and keep stirring. After 1 minute, turn flame to low. Keep on stirring till besan changes color for about 30 minutes. 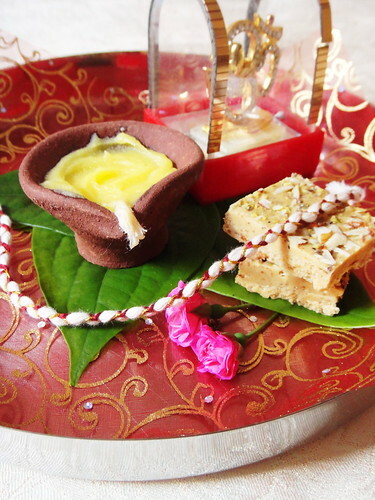 Keep an eye on the color and smell of the besan. Stir continuously so that it is uniform in color. 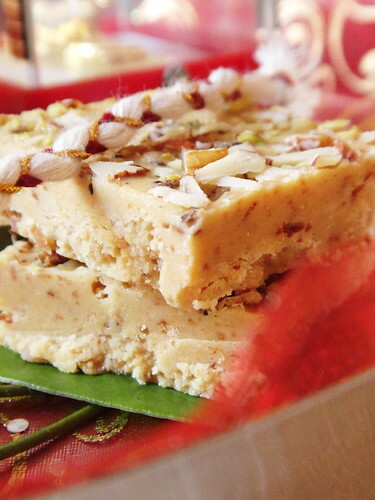 Once besan gives an aromatic smell, add sugar and cardamom. 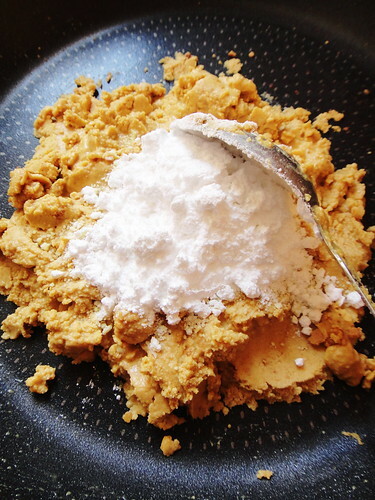 Remove from heat and mix thoroughly so as to incorporate sugar. 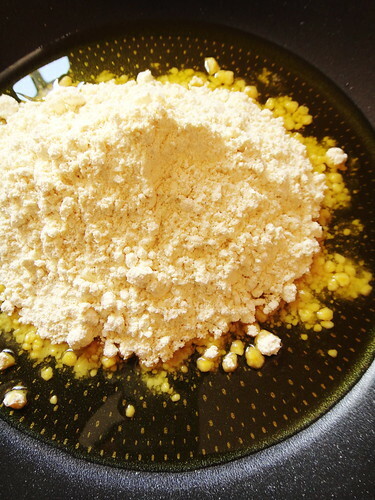 Add a bit of ghee if mixture turns too dry. Grease the tray in which you want to set barfi with a little ghee. 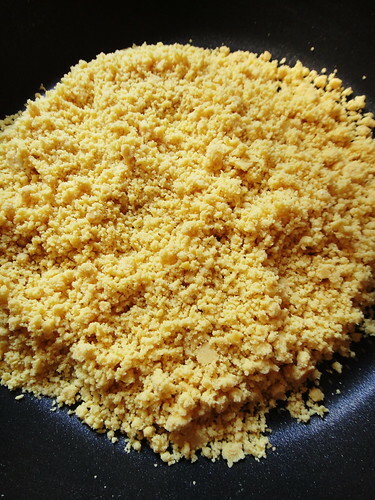 Spread the mixture in tray while it is still hot. Decorate with chopped almond and pistachios. Leave the tray to set. 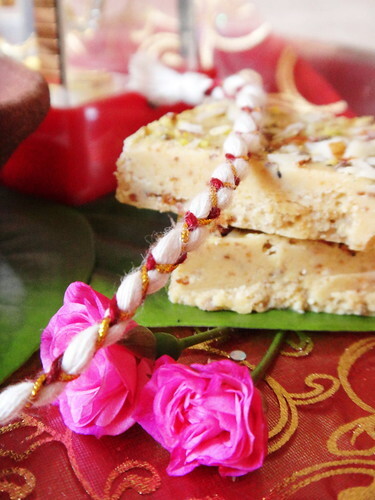 Once barfi is set, cut into desired shapes. I tried it for the first time. I have well-done it. So simple recipe. Thanks a lot.